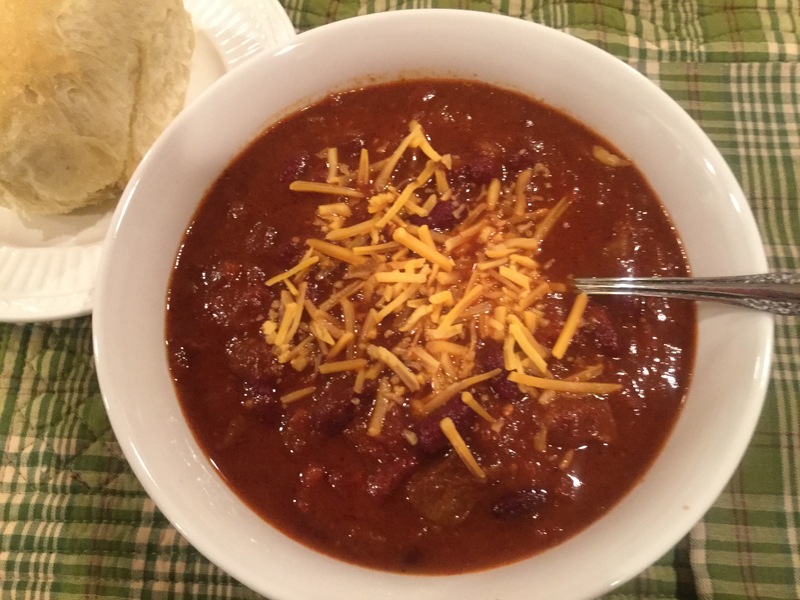 When it is cold outside my husband and I enjoy making this hearty chili. It is made with a chuck roast that is trimmed and cut into cubes. This chili has a little heat, but not a lot and you can adjust the seasonings to your taste. 2 ½ to 3 ½ lbs. beef chuck cut in ½ inch cubes. Heat oil in large heavy pot. When hot add meat, onion, and garlic. Sear until all pieces of meat are lightly browned, turning constantly with spoon. Stir in chili powder, oregano, cumin, and crushed peppers. Mix well, add broth, tomatoes, tomato paste, salt and sugar. Break up tomatoes if you have large pieces. Simmer for 2 hours or until meat is very tender. Rinse beans, add and heat. (May be simmered, covered, entire time if not too watery). If chili is too thick, add a 15oz can of tomato sauce. I usually just add this at the beginning because we like lots of beans. This chili freezes well. It is also a nice treat to share with friends. Tip – If you preferred chicken over beef, substitute skinless, boneless chicken breast for the beef and use chicken broth instead of beef. This is just as delicious. PS. My French Rolls and winter salad are a perfect paring with the chili.